The Career Panel and Networking Event is a 1/2 day session exploring non-academic career options. 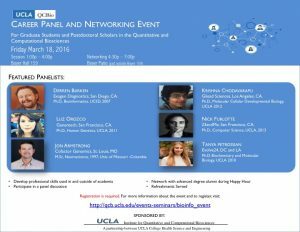 Our panel consists of UCLA graduates working in a variety of non-academic industries. This event is open to Graduate Students and Postdoctoral Scholars in the Quantitative and Computational Biosciences. Exagen Diagnostics, San Diego, CA.